In spite of some confusion on the run up to T.H.E. Show held this past weekend and the relatively small number of vendors, I can report that it was very successful from my perspective. The AIX Records booth was located at the entrance to the marketplace. It was hard to miss the layout of my DVDs and Blu-rays discs AND the Music and Audio: A User Guide To Better Sound book on the tables. I had my trusty Oppo Universal Player (a custom modified BCT-101 with multiple S/P DIF digital outputs) connected to a Benchmark DAC-2 HGC and a couple pairs of Oppo PM-1 headphones. I didn’t bring the YARRA 3DX sound bar this time because my consulting agreement with them ended about a month ago (I’m still in regular contact with them. I’m just not responding to the community as I had been doing over the active period of the campaigns.) The YARRA 3DX Setup DVD and AIX Records tracks are still in production. The plan is to have the disc included in the box. The show was well attended by all reports. One organizer told me that they sold about 3500 tickets but I’m not sure whether that’s individual people or people across days. I had lengthy discussions with a retired orthopedic surgeon, a healer/engineer, a drug company CFO, a writer of 11 comedy books, a guitarist that had recently gigged with Albert Lee, and finally had the chance to meet Glen Hall, a long time reader/commenter of this blog. 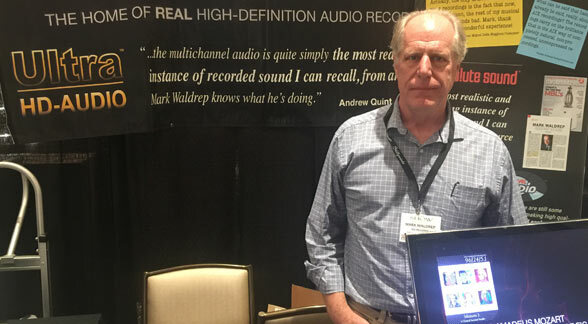 Thanks to all of the familiar faces that stopped by the booth (including multiple visits by Dennis Ashendorf) and welcome to the AIX family for those that are experiencing real high-resolution music for the first time. It’s always a pleasure to share the fruits of my 18 years of making new high-resolution recordings. I wish I could assemble a big ballroom with a terrific surround system like I used to do at AXPONA, but those days are behind me. In fact, as I explained to a few attendees, I’ve probably produced my last recording. I’m not going to close the door completely, but it’s expensive and requires an insane amount of effort to produce products like the DVDs and Blu-rays that I offer. If were to simply limit the productions to high-resolution audio (ignore the video components), it would simplify things but I think watching the players is a big plus. I received a call this afternoon from an aging audiophile. Bill felt obligated to call and tell me how much he enjoyed the couple of recordings that he purchased over the weekend. He said, “I’ve been listening to records for over 50 years and have assembled a very revealing system. I thought I had experienced some great recordings but nothing prepared me for the fidelity that came from your discs. The Chopin recordings was the hands down the best example of recorded music I’ve ever heard — and I have dozens of piano recordings”. He went on to say that he can’t understand how or why audiophiles still cling to vinyl LPs. Honestly, I can’t either. I sold a couple of big band DVDs to a gentleman that told me he’d drifted back to vinyl LPs because “they just sound better”. I’m anxious to see if real world dynamics and extended frequency response will prompt him to write to me. I’m not really qualified to report on the rest of the show. I didn’t make it to the second and third floor demo rooms on show days. I heard from others about the accessories being demoed in the Synergistic Research room (these are the people behind the $20,000 power cable and a bunch of other snake oil accessories like adhesive dots), the comparisons offered by the MQA people (most reported that they heard no difference — not big surprise there), and a guy that purchased $400 worth of plug fillers for his power strip (after I explained that they don’t — and can’t — affect the fidelity of this system. He said he would take them back). I visited the MBL room adjacent to the marketplace and the YG Acoustics room around the corner. They — and plenty of others — played their systems very loud. They YG speakers were surprisingly not “toed-in” as recommended and the omni-directional drivers on the MBL speakers diminished the sound stage in my opinion. But the overall sound was as most audiophiles would expect. I lament that most room source from CDs, turntables, or analog tapes. I didn’t see or hear about anyone playing real high-resolution audio and there certainly weren’t any 5.1 surround rooms. The show lacked a seminar series, which was unfortunate. I spoke to the organizers and offered to help organize next years’ presentations. I think it’s a critical component of any audio trade show. I’m not convinced that another turntable setup seminar is needed but there are plenty of topics that attendees could learn about — why digital audio isn’t about stair steps or how to tell a real HD file from a fake one. Attendees deserve a balanced source of information about our passion and hobby. There’s way too much “fake news” in the audiophile world. Contrary to some writers who say that technical specifications should be ignored in favor of purely subjective listening, there is room for real information. Almost all of the rooms except one used expensive cables, and I left thinking that Ansuz cables made a noticeable improvement (30 k$), BUT the 18 k$ Perfect8 speaker room used copper strands from the toroids in their crossover ($200) for speaker cables and not just cheap power cables but just two $4 power strips daisy-chained as the power source for the 110. By the way, standard files were streamed over a Raspberry Pi and daughter board amp (about $200). The sound was superb. Go figure. Tweaks work, but not too much. Spend your money elsewhere on speakers and content like AIX. Thank you for the very nice report on The Show in early June. I have been a very big advocate of high end audio for over 40 years. I use to record on a semi-pro Tanderg 4 track reel-reel tape tape, and accumulated well over 100 tapes (all 7″ reels). I used a Kenwood Model 600 integrated amp while doing a lot of these recordings, whereby I could flip a switch and compare the output of the recording (Tandberg deck has 3 heads so this is quite doable, and even necessary). I would compare constantly the source with the recording, and if not exactly the same to me ear, then I would adjust the bias or use different high end reel-reel tape . But the Tandberg Model TD 20A has an outstanding frequency response,, even at 3 3/4 ips! Its only ‘weakness’ was the relatively low dB range – mid 60’s, so the tape hiss was audible. So, early on I bought a DBX 124 encode/decode box, and it raised the dB range of the tape deck by 20-25 dB, and the hiss was essentially gone. But what does this have to do with today’s audio technology and audio shows. I went to the audio show at LAX last year in June, and many show rooms had reel-reel professional decks playing music at 15 ips, and they sounded great! The soure for these tapes however, was NOT from records (vinyl), but rather from the original master tapes. And large numbers of show rooms had ripped music playing from laptops, and that sounded great as well! But that show did have a few rooms playing high end audio, and multichannel as well. So, it is very sad news to hear that this year’s show did not. I am rather glad I did not go! I am also a bit afraid of what future audio shows will display. But more about my recording days, and the historyw of technology in my sound room. Back then, I had a pair of Dahlquist DQ-10s, which sounded amazing, but with a rather poor low end. I went to many audio shows around the West coast, and show rooms in my city, and even took the DQ-10s into one audio store/showroom to compare. Nothing came close to its very natural and detailed sound, UNTIL I heard the Legacy Focus at one show. That was the end of my DQ-10’s, and I sold them soon after buying the Focus speakers. This sound was sooo good, and very, very good at the mid lows, and very low lows. I started to build a home theater then, and have never looked back. I started to use a Kenwood M2A to power the speakers, and after a while, I only the use the preamp of the integrated Kenwood Model 600. I then migrated to a formal pre-amp, and bi-amped the Focus with the power portion of the Kenwood Model 600. Eventually I replaced that with two Kenwood MX-1000 stereo power amps, each bridged to the high & mids of the Focus speaker (270 RMS wpc). Then I added a center channel (Legacy Siver screen), side speakers (Legacy dipole speakers), and finally rears (PSB Startus Goldi’s). While I was building the ‘new’ system, CDs were replacing vinyl, and recording to tape no longer was upmost important. As CDs and DVDs became better audio wise, I left behind the vinyl industry completely. And my system grew from a top notch audio one, to a top notch home theater. In doing this, I experimented with listening to stereo audio music in All-Channel Stereo, which was much nicer than just stereo. But keep in mind that my center channel speaker is essentially the mids and highs of the Focus, so the sound emitting from the center was identical to the Left & Right speakers. The rears were/are also full sized top of the line (at the time) PSB speakers (PSB line was, and still is very nice). Then I started getting and playing 5.1 audio music, from CDs and DVDs (many formats). When playing just stereo with these sources, there was a definite drop in great sound. So, I played with the various playback/encode arrangements (pre-amp Integra DHC 80.2), looking for the optimal sound. For standard stereo sources, like CDs, the All-Channel Stereo usually sounds best, which included being than just 2 channel stereo. With sources encoded in 5.1 or 7.1, the best sound is always with one of the 5.1 (or better) encode choices. The original AIX CDs and DVDs sounded fabulous, and the video on some were of near Blu-ray video resolution, but were not really Blu-ray and played on regular DVD players. Now AIX is releasing Blu-ray DVDs with their great audio (produced in many types of music), and these are terrific!. But, my audio story does not end here! With the release of AIX high end audio, which often includes high end video, I have come to PREFER to watch the artist while the music is being played, and just plain music (no video, or with poor video) is nowhere near as pleasing. Besides AIX recordings, many documentaries, and Orchestras are starting to produce their music in 5.1 (or higher), and some are provided over the Internet. One example of this latter situation is with the world famous Berlin Philharmonic, and with a membership you can watch a lot of the recent recordings online. So, in conclusion, I think high end music and video must go together for the optimal enjoyment experience. Perhaps I am a bit biased, since I have combined my originally all audio system into a very wonderful home theater, which simply means that both high end audio should co-exist with high end video. In my case, I have a projector (HD and 3D capable) displaying on a 123″ high reflectivity screen. So, movies are just as good, and even better (and even better since I can set my own volume, and the balance between the center channel in comparison to all the other speakers in the system) than going to a movie theater. On a final note, my system has two subs: an HSU 12″ HRSW12V driven by an external HSU 500 watt amp and a James 15″ sub. The HSU I use with the electronic crossover provided by HSU power amp, which is simply fed by the Left & Right channels from the source. On the other hand, the James sub is connect to the sub via the Sub Out jack from the pre-amp, and depends on gthe source providing this sound. This way I get bass whether or not there is a sub channel provided in the source. And when the source does provide both, such as with movies, the sound is absolutely AMAZING.\! So, I conclude that anything being produced today should seriously be combining the audio with the appropriate video for a much richer and more pleasing experience. Thanks Vincent. I agree that video does enhance the enjoyment of music. And not just for opera, symphonic, or chamber music. But it’s not how commercial music is created. Back in around 1982 I remember hooking up a betamax video recorder with simple RCA cables to our family hi-fi when in my early teens. Having sound coming out of two proper big(!) speakers rather than just the tiny TV speaker and being able to watch a concert as well was just brilliant. I saved up and bought a Philips Laservison player a year later (they were very cheap – no-one wanted them) and was blown away by the sound and picture quality. Fast forward to now and potentially the skies the limit with audio and vision, it really is exciting stuff, just such a shame that multichannel music is so badly supported – not helped by Oppo discontinuing their superb Blu-ray players range. I still believe music should stand on its own merit but when combined with great video it really is an absorbing experience. Glad to hear you had a good show, and saved someone from being “Oiled”! It amazes me that these fallacies persist after all these years, with all the data. Take a tone generator, run it through a round of AD/DA hook the signal up to an oscilloscope along with the original signal on channel 2. Perhaps to keep the sound of children being electrocuted below the noise floor of your system? If you could only get one of those 20,000 power cables for an iPad! The Laurel & Yanni controversy. My wife says it’s all about frequencies that some sound system reproduce better than others. I believe it is more of a trigger that fools the brain…less to do with the ear. What’s your opinion, Mark? I know I am out of order here, sorry. There is something to the frequency components of the piece. I saw a video with a spectral analysis…different systems produce different results. Thank you Mark. “…something to the frequency components”. Yes, the same person may hear Laurel, but hear Yanni on a different audio system. However, some people hear Laurel and others hear Yanni on the same sound system. I still fail to grasp the full picture Dr. Thanks again Mark for the show report, almost fell off the chair laughing that someone would pay $400 bucks for Plug blocks. We will sure miss not having any new Aix 5.1 BluRays. I have purchased most of the sonically good BR’s on the market. Yours are at the top of my list. Joe Bonamassa live at the Beacon in notable, and David Gilmore live at Royal Albert Hall, Hall and Oats at the Troubadour concert, Jeff Beck at Ron Scott’s. Most of the, upsampled music from old concerts are crap, both visually and sound wise. Seems small venue’s with good mic placement and mixing, is far superior to large stadium concerts which are almost not worth listening to, unless you were actually there, in a sweet spot. I’m glad you had a good show. I thought the venue was a bit of an upgrade but I felt the overall show was pretty anemic. (I was there all day Saturday.) There were far fewer rooms than in previous years and, personally, I didn’t find much of anything to get excited about. The overall trajectory of these Southern California shows does not bode well. I spoke a fair amount to an industry writer and Orange County regular who both seemed to have the same impression as I did. I heard one of the waiters comment to a bartender “So *that* was the lunchtime rush?” as there was no rush whatsoever. I have no interest in listening to $300,000 systems, but there are usually a few rooms with some components I could imagine buying – like Magnepan, ELAC, Emotive, Benchmark, KEF, etc. I didn’t see much of that and nothing like the much-appreciated $3 – 5,000 system room last year at the show near LAX. Hopefully this lull was the residual result of “warring” Southern California audio factions and the last-minute cancellation of last year’s Orange County show. I was disappointed. I’m seeing less and less point in these shows and I feel like I’m at least some segment of their demographic. It was a small show and many of the best vendors weren’t there.